Two sturdy speaker stands and a quality bag to hold them at one special price. Light and compact, the SSP7750 is an excellent choice for light-duty work in bars, clubs, hotels, churches and other venues where small portable PA's are routinely used. The complete pack includes a pair of aluminum stands and a carry bag to keep them looking new no matter how often they are transported. An ergonomic knob adjusts stand height from 37" to 60", while the folding tripod base maintains a low center of gravity, allowing exceptional stability when used with speakers up to 60 lb. in weight. The 1-3/8" upper shaft is compatible with virtually all current polemount speakers, and the included 1-1/2" insert accommodates older models for a universal fit. Like their full-size counterparts, SSP7750 speaker stands feature steel security pins, non-slip rubber feet, and a theater black finish. They fold easily for transport and storage, fitting nicely into the included bag. 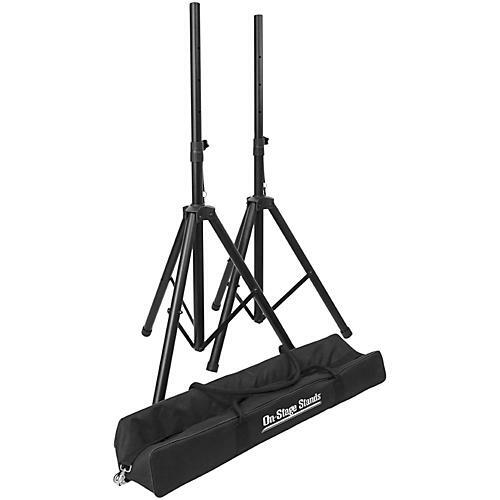 The bag itself features durable nylon material, an adjustable shoulder carrying strap, two carrying handles, and a heavy-gauge two-pull zipper.The additional cost of speaker stands can be hard to justify for some customers, so On-Stage Stands has priced the SSP7750 for any budget. Whether using entry-level vocal monitors or top-of-the-line compact full-range speakers, getting them off the floor and above the crowd with the SSP7750 is the easiest and most affordable way to maximize coverage and clarity. The Pak includes:(2) Tripod Speaker Stands and a Speaker Stand Bag. Save money on your setup with this great package. Order today!